"I hope you never have to go through anything like I did." The Wrong Man isn�t your typical Hitchcock picture�imagine an especially Kafkaesque extended episode of Law & Order, shot in a v�rit� style, and you�ll get a sense of what you�re in for, a film very different in style and tone than even the Hitchcock pictures of this period. (Rear Window was made two years before; Vertigo, two years after.) It�s also a kick to see the director�s work with one of the great iconic American actors, Henry Fonda, in this, his only Hitchcock movie. Usually, when you see the words "based on a true story," you can fairly well count on it that everything that follows will be trumped up by the filmmakers. But The Wrong Man prides itself on its authenticity, and on being the only Hitchcock film overtly taking its raw material from actual events. (One might quibble and mention Rope, obviously inspired by Leopold and Loeb.) Fonda plays Manny Balestrero, who plays the bass at the Stork Club; he�s a solidly middle-class citizen, commuting to the tony night spot from his home in Jackson Heights, Queens, where he lives with his lovely wife, Rose, and their two sons. Early on, the movie seems deliberately trying to lull us into a proletarian complacency�talk about meeting the expenses, how the boys are doing�but because we�ve seen the words �directed by Alfred Hitchcock,� we�re waiting for the long knives to come out. And of course they do. Rose needs some dental work done, and to cover the expense, Manny wants to borrow against a life insurance policy in her name. He visits his insurance agent�s office, where a couple of the employees shiver when they see him�they�re certain that this is the same man who held the place up just a couple of months ago. The police take him in, and Manny�s world turns into a jurisprudential hell, as he�s being accused of crimes that he knows he did not commit. Hitchcock focuses with almost fetishistic concentration on the details of police procedure�Manny getting fingerprinted, his brief stay in the pen before making bail�and we witness violations of contemporary police procedure that would make Mark Geragos drool: Manny is asked, for instance, to walk up and down the aisles of the other stores that have been robbed, so that the proprietors can get a good long look at him. (In its focus on the procedural aspects of the law, the film shares some affinities with Call Northside 777, though in that picture the leading man, James Stewart, is the investigator, not the accused.) There seem to be more location shots in this movie than in most of Hitchcock�s others, and he reinforces the point with lots of footage of characters walking up and down stairs, along the streets, in the subways; it�s a great look at Eisenhower-era New York, when all the men wore fedoras and ties, even to the corner store, and no woman would leave the house without being fully made up and in her best dress. Image Transfer Review: Occasional imperfections in the print are evident�a few too many scratches and discolorations appear, and the transfer isn�t as pristine as some of the others in this Hitchcock collection. Audio Transfer Review: The dynamics on the mono track are problematic; this is especially true in Vera Miles�s scenes, as her voice is occasionally subsumed by Bernard Herrmann�s score, which is a shame, because they both merit being listened to. Also, there are occasional sync problems, especially in the last act of the story. Extras Review: The director narrates an original trailer, and quite informative is Guilt Trip: Hitchcock and The Wrong Man (20m:15s), a brief overview of the movie with, among others, Peter Bogdanovich, Robert Osborne and Richard Schickel; one of the sumptuous details they mention is that Vera Miles, who is excellent in this movie, got pregnant and couldn�t play the lead in Vertigo, and the director never forgave her. The real star of the documentary, though, is Paul Sylbert, the film�s art director�he�s great talking about Hitchcock�s and Fonda�s working methods, and on making the seamless on-screen transitions between location footage and shots from a Hollywood soundstage. Though it departs in some significant ways from the director�s established formula, The Wrong Man has many virtues, particularly in its leading man and restrained, almost documentarian cinematic style. It may not be exactly what you expect from a Hitchcock movie, but it�s full of rewards and a very high level of craft. 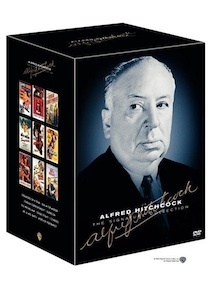 You need not be a Hitch completist to make the right choice with this one.